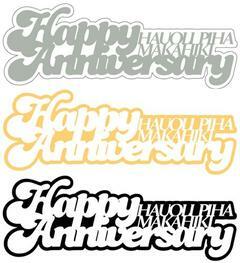 Beautiful 2-color, two piece Happy Anniversary Laser Cut with intricate details of the word Happy Anniversary in Hawaiian and English. The solid bottom layer provides contrast and makes the laser jump off the Page. Pieces are separate so you can assemble flat or create a 3-D look with foam adhesives. Perfect for your Hawaiian or Tropical scrapbook album! Dimensions: 2" x 5.5".